Proper measurements ensure a proper fit. Make sure you are standing, wearing the socks or stockings you will wear with your new shoes. Using one of the following charts, convert your inches measurement to your U.S. shoe size or Euro shoe size. Use this conversion to order from our European-Sized Brands. Note: The tables above are for your reference only; For your WIDTH reference, please see the WIDTH chart below. for dancing. The size charts below are for your reference only. Please make up your own mind for your own choice. AA / Slim (S) - Available lightly in basic styles. DSOL does not carry any shoes in these. B / Narrow (N)- These are available more so in basics and are spread lightly in fashion styles. Most styles begin at length 9 or 10 while most can end at 13. It is very uncommon to find a narrow width before length 9 and after length 13. DSOL does not carry any shoes in these. D / Medium (M) - This width is available in all styles. Your basic run of length begins at 8 and ends at 13.
and can end at 11. Wider widths are generally more available than the narrow widths. Click on Measuring Width to learn more about how to measure width or how to use Fitting Tool. Recommended: Our shoes run American Street size, but for dancing, we recommend you to choose half (1/2) size smaller for Ladies Sandals, as they can easily be stretched out. For Pumps, Men's Latin & Standard we suggest you to remain the same as your street-size shoes. Note: A heel style is subject to the height; i.e. 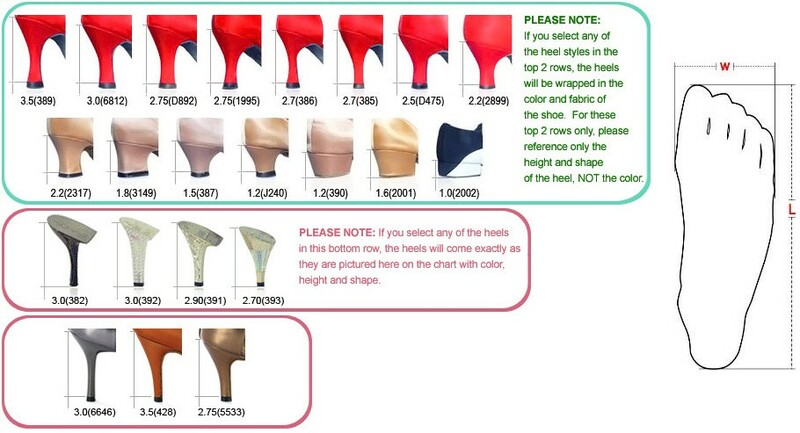 If you choose 1.8" heel height, you will get the heel design of # 3149 for your shoes. How to use Length Converter to convert "inch" to "centimeter" or vice versa?